Body condition is important for reproductive success in many vertebrate taxa. Animals need to be able to assess how much stored energy is available for them to devote towards reproduction as they approach a breeding season. Thyroxine, a metabolic hormone, affects the storage and mobilisation of fats. We investigated the role of thyroxine in conjunction with the actions of reproductive (17β-oestradiol, testosterone) and metabolic (corticosterone) hormones in a viviparous, annually breeding skink, Niveoscincus metallicus. Exogenous thyroxine, alone or in combination with 17β-oestradiol, testosterone or corticosterone, was administered to Niveoscincus metallicus, by injection over several weeks. We measured changes in patterns of tail and abdominal fat storage in adult female skinks in response to these hormone treatments during two energetically important reproductive phases, post parturition (energy storage) and vitellogenesis (energy mobilisation). We calculated changes in body condition scores as the residuals of regressions between body (snout-vent) length and mass. Body condition was significantly affected by all treatments, and showed reproductive phase effects with all treatments except corticosterone. 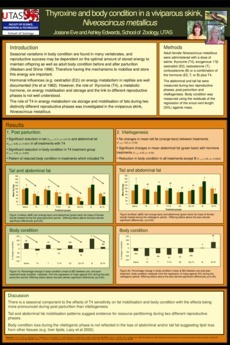 It appeared that the other hormones interacted with T4 to play a role in energy storage and mobilisation, but the effects of corticosterone on energy metabolism were independent of reproductive phase in this species.